Featuring one of Marvel’s rising female superheroes, with an immensely popular ongoing comic book series and highly anticipated cinematic debut, Sideshow is proud to introduce the Captain Marvel Premium Format™ Figure! Caught in an explosive blast from an alien device, Carol Danvers first used her amazing abilities as the incredible Ms. Marvel, before ultimately assuming the esteemed mantle of Captain Marvel. Soaring over the conquered remains of a Brood spaceship, the former ace fighter pilot radiates confidence in her modern superhero flight suit and Kree helmet, taking her trademark bravado to the stars as Earth’s resident Avenger-in-Space and ally to the Guardians of the Galaxy. 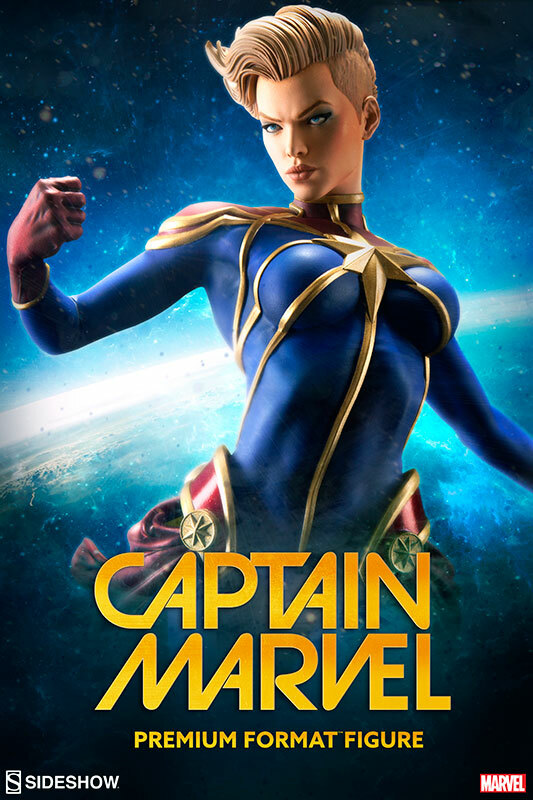 Showcasing the mighty champion as the shining star she was always meant to be, Sideshow’s Captain Marvel Premium Format™ Figure is a must-have for any Marvel fan and collector!